Chris Franchetti Michaels. 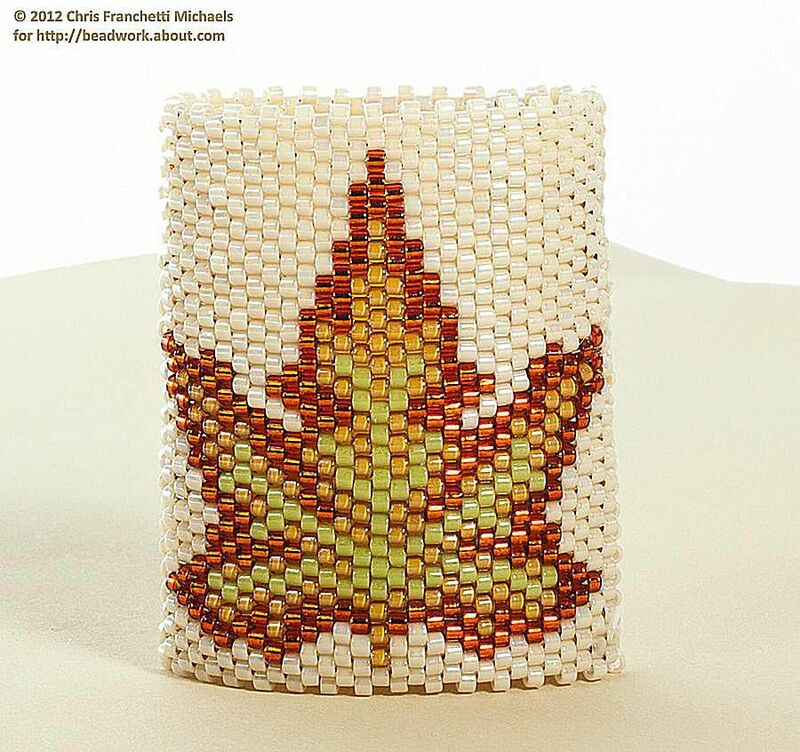 A completed tube of beadwork using the maple leaf pattern. In this tutorial, we'll follow a tubular peyote stitch pattern to make a beaded amulet bag pouch. You can use the same technique to make a beaded sleeve to wear on dreadlocks or a beaded finger ring. Note: With this technique, both ends of the beaded tube are "jagged," with every other bead recessed by the space of one half bead. To make a tube with smooth ends, you should stitch a length of flat peyote stitch and then zip up the ends to form a tube. If you've never tried tubular peyote stitch, it's a good idea to start with a practice swatch. Just like with flat peyote stitch, there are two essential variations: even-count and odd-count. The even count stitch has an even number of rounds, and the odd-count stitch has an odd number. Next, pick out a pattern chart. It's helpful to print out a color copy that you can draw on with a pen or marker. Chris Franchetti Michaels. The initial ring of beads, with a stop bead shown in orange. Start by deciding where to begin reading the pattern. For even-count peyote, this needs to be a corner with a recessed bead; for odd-count, it needs to be a corner with a protruding bead in a row that begins and ends with protruding beads. In most tubular beading patterns, you should begin in a corner near the end of the diagonal line of cells that are outlined more heavily than the others. Learn more about reading even-count peyote patterns. Learn more about reading odd-count peyote patterns. After preparing your needle and thread, string all of the beads for the first two rounds, starting at your selected corner. In the example, I used Size D Nymo beading thread and a size 10 Tulip beading needle. The beads are size 11/0 Delicas. I started at the lower left corner. Chris Franchetti Michaels. Three rounds of tubular peyote stitch completed. Recall that with peyote stitch, the first beads that your string become the first two rows of the pattern. That means that the next beads you stitch will be from the third row. At this point, I like to use a marker to cross off all of the beads for the first two rows. For the leaf amulet bag, I did this just for the half of the pattern that has the leaf on it. In many patterns, the first bead in each new round is designated by a more heavily outlined cell on the chart than the other cells. The first of these cells represents the first bead in the third round. Starting with that bead, read the pattern horizontally, stitching one bead at a time using tubular peyote stitch. In the above photo, I have finished stitching the entire third round, including the "step up" through two beads that occurs at the end of every round in even-count peyote. This puts the thread in the correct position to begin the fourth round. Chris Franchetti Michaels. Four rounds of tubular peyote stitch completed. Stitch all of the beads in the fourth round the same way you did for the third. In the example, this is the first round that contains colors other than cream. I began by crossing off all of the beads for the third row (below the leaf). I then counted how many cream beads I needed to stitch until a color bead was again needed. Starting with the outlined first bead in the fourth row of the pattern, there are three cream beads and then an orange bead. After stitching each of those beads individually, I checked the pattern again. I now had two cream beads and one yellow bead to stitch. I stitched them, and then checked the pattern again. Now I had two cream beads and one orange bead to stitch. This counting method is my preferred technique for following pattern charts, because it helps me keep my place efficiently. After that last orange bead, all of the remaining beads in the round were cream colored. I stitched the next three cream beads, which brought me to the place in the pattern beyond where the colored leaf appears. This big area of cream colored beads will be the back side of the amulet bag. To make it easier to stitch the cream half of each row, I counted how many cream beads needed to be stitched in every round in order to stitch back around to the front side of the bag. It was a total of 15 beads (see the second photo from the top, above). After stitching those 15 cream beads, I checked the pattern again. I saw that I had one more cream bead to stitch before completing the fourth round (see the third photo from the top). I stitched that bead and stepped up in preparation for the fifth round. Chris Franchetti Michaels. Many more rounds of tubular peyote completed, and the completed rows of the pattern marked off. Keep stitching one round at a time, reading the pattern from one side to the other (usually left to right). Remember that the first bead in each new round moves over by the space of one column. Visually compare you beadwork against the pattern as you work to make sure you haven't made a mistake. When you reach a point where you only have about six to eight inches of beading thread left to work with, stop and begin a new thread. You won't need to make any knots if you're stitching with cylinder beads because they fit tightly together and hold the thread in place. Chris Franchetti Michaels. The pattern for the front and back panels of the amulet bag completed. Once I reached the pointed in the leaf pattern where the first bead in each round was located over on the all-cream side, I could no longer use my "count 15 cream" method to stitch the back of the amulet bag quicky without losing my place. Instead, I took the time to make specific counts and did a lot of double-checking to make sure I followed the pattern correctly. When you finish, weave-in and trim off all of the remaining thread tails. In the first photo above, the beadwork is still in its original tubular shape. In the second photo, I have gently squeezed it down into more of an amulet bag shape. Learn how to add fringe to your amulet bag.